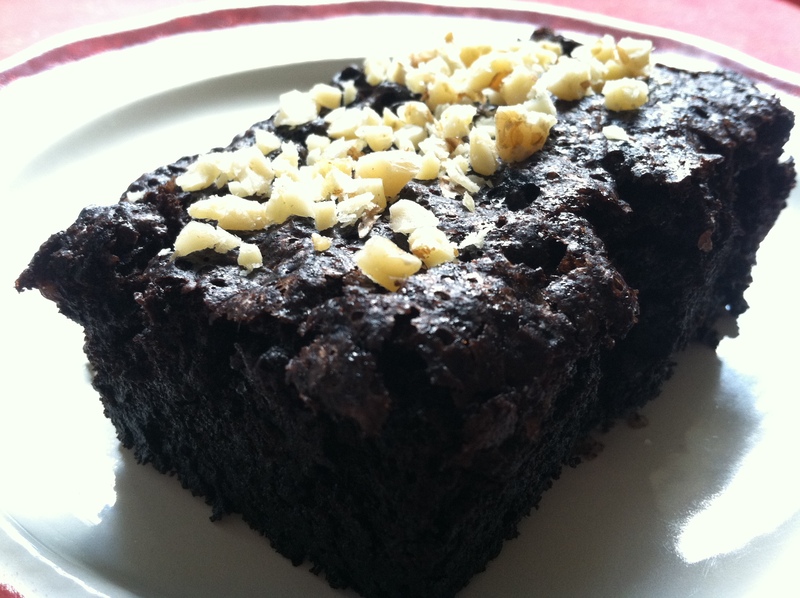 One of my family’s favorite recipes that I have come up with since beginning the blog is Porter Brownies with Walnuts. I think that when I made them last night for St. Patrick’s Day to follow our corned beef, cabbage, and potatoes dinner it was the fifth or sixth time I’ve made them in the little over a year that I’ve been blogging. They have been delicious all but the one time they totally flopped. They totally flopped because I was a total dingbat and misread my own recipe when I got in a hurry making a large dinner. I used only 3/4 c. sugar rather than 3 full cups. They were so bad that we had to add chocolate frosting just to get them down. 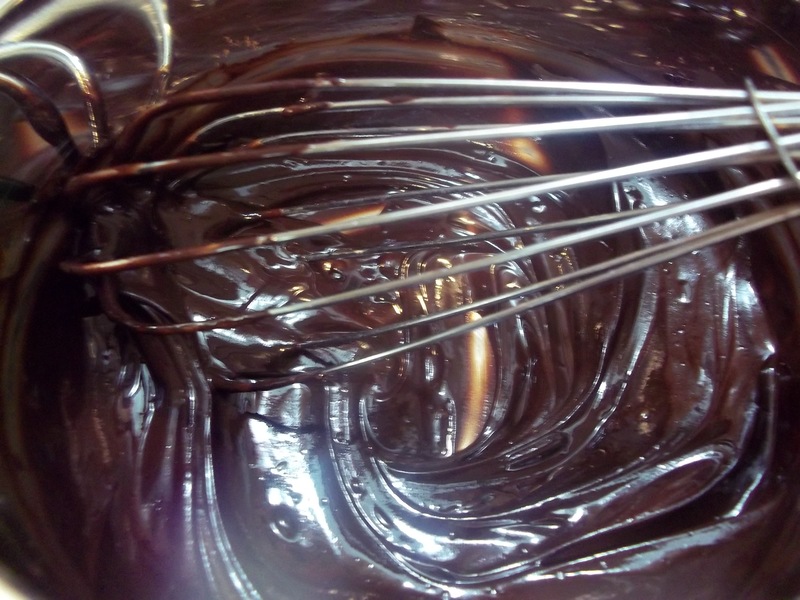 Since creating the recipe, I have switched to only Hershey’s Special Dark cocoa powder for all of our chocolate baking and milkshake making when I don’t use real chocolate. I figure that if we are going to eat chocolatey desserts, we should at least get the antioxidant benefits of dark cocoa and chocolate. So yesterday was the first time, I believe, that I used dark cocoa to make my porter brownies and now there is no going back. What an amazing difference! I also used extra virgin olive oil, yes…the dark green pungent version, rather than the canola I used in the original recipe. That may sound strange but after making Lemon Olive Oil Cake, I’m sold on using this rich oil for intensely flavored desserts. It really only adds to the depth of flavor and leaves no bitter olive taste. I can only guess that this substitution was another thing that made this last batch of brownies the most rich and moist I have ever had. The turbinado sugar I swapped for the white we rarely use made the most crunchy, sweet top to the brownies. I love baking with turbinado because the large crystals don’t have time to fully dissolve into a batter and there is always that crunch in the final product. YUM! The froth from the beer in my original recipe makes a lacy, crunchy brownie top. It seems to have taken the turbinado crystals with it this last time, to settle on the surface of the batter when it baked. Also, I only used 1 cup of walnuts rather than the 2c. I added to the original recipe and left them whole. Sometimes I coarsely chop them. 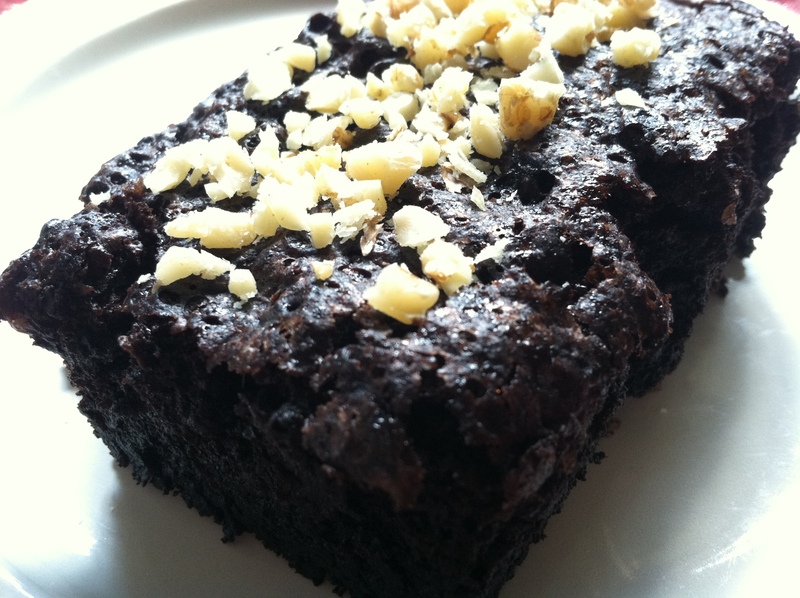 The brownies are so much better with the walnuts left whole, in my opinion. I think that next time, however, I will leave them out altogether. Another thing I did differently was to hand mix the batter, lightly, rather than using my mixer as I have always done before. I didn’t even beat the eggs before combining with the sugar, just mixed them together well before simply stirring in the beer and folding in the dry ingredients until just moistened. I think it made a difference in the outcome. Heat oven to 375 degrees. Lightly grease a 13X9″ pan. Melt the butter. Add the oil and 1/2 c. cocoa. Beat eggs and sugar until well combined. Stir in melted butter/cocoa mixture and beer. Sift together dry ingredients and remaining 1/2 c. cocoa. 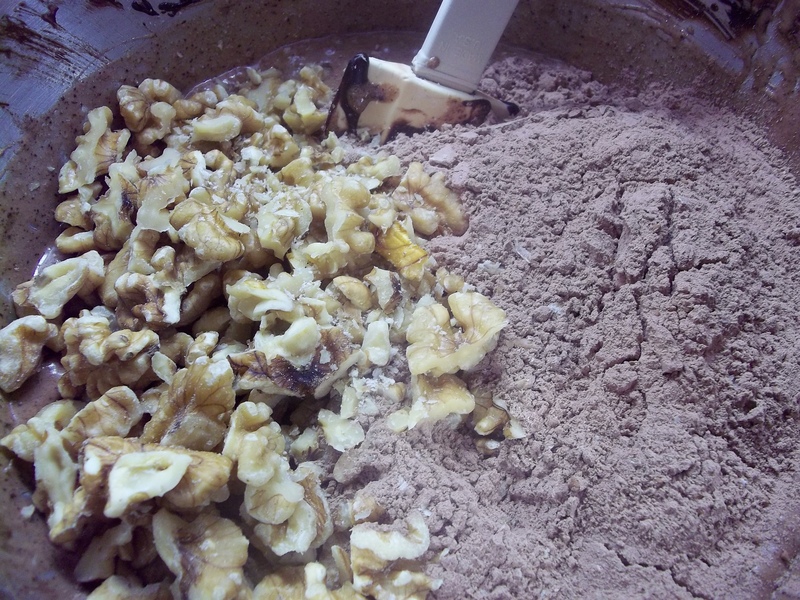 Chop walnuts very coarsely or leave whole if you like and add to dry ingredients. Add dry ingredients to wet. Fold in gently. Pour into prepared pan. They can be served hot but are crumbly. They cut and serve more cleanly when completely cooled. Your chocolate always looks sooo dark. Now I know you secret.